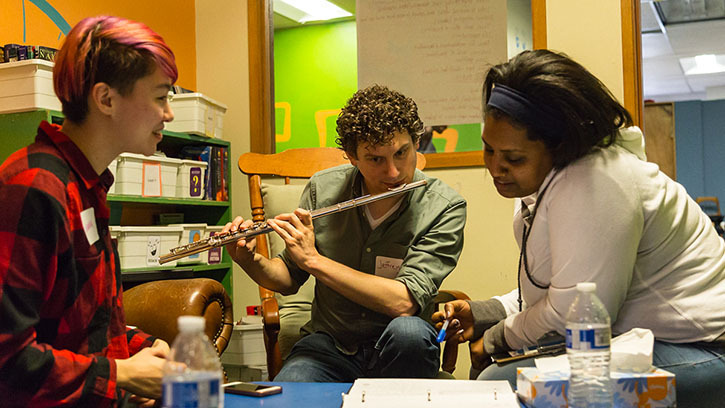 Seattle Symphony Associate Principal Flute Jeffrey Barker is one of just five orchestra musicians from across the United States who will receive Ford Musician Awards for Excellence in Community Service from the League of American Orchestras. Recognizing the transformative power of music, the awards honor those in the orchestra field who employ music for the benefit of the greater community. Since joining the Seattle Symphony in 2015, Barker has immersed himself in community engagement work. He has collaborated on developing Sensory Friendly Concerts, coached sectionals for side-by-side performances with local high schools, and actively supported the Seattle Symphony’s Lullaby Project and Simple Gifts initiative, which empowers individuals experiencing homelessness to connect with their creativity. “Our Simple Gifts initiative is such a crucial part of the work we do at the Seattle Symphony, and we are so lucky to have musicians like Jeffrey to bring its impact to light,” added Chihuly. In addition to his work through the Seattle Symphony, Barker also advocates on issues of homelessness by speaking publicly and helping partner organization Mary’s Place raise money for shelters. Barker and the other musicians will receive their awards at the League of American Orchestras’ 73rd National Conference in Chicago, June 13-15, 2018. Now in its third year, the League’s Ford Musician Awards program, made possible by the generous support of Ford Motor Company Fund, honors and celebrates professional orchestra musicians who provide exemplary and meaningful service in their communities and make a significant impact through education and community engagement. The Seattle Symphony’s Community programs are supported by the Ann & Gordon Getty Foundation, Citi Community Capital, KeyBank Foundation, the League of American Orchestras, the Puyallup Tribe of Indians, Tulalip Tribes Charitable Fund, the U.S. Bank Foundation, Wells Fargo Foundation, the Wilson Sonsini Goodrich & Rosati Foundation, and individual contributions to the Seattle Symphony Annual Fund.